This morning at Tools of Change, I gave this presentation. In short, I argue that in order to sell content into Africa, publishers can’t rely on print distribution, or even ebook distribution as we know it. They are going to need to let people on the ground repackage and distribute their content in unpredictable ways. 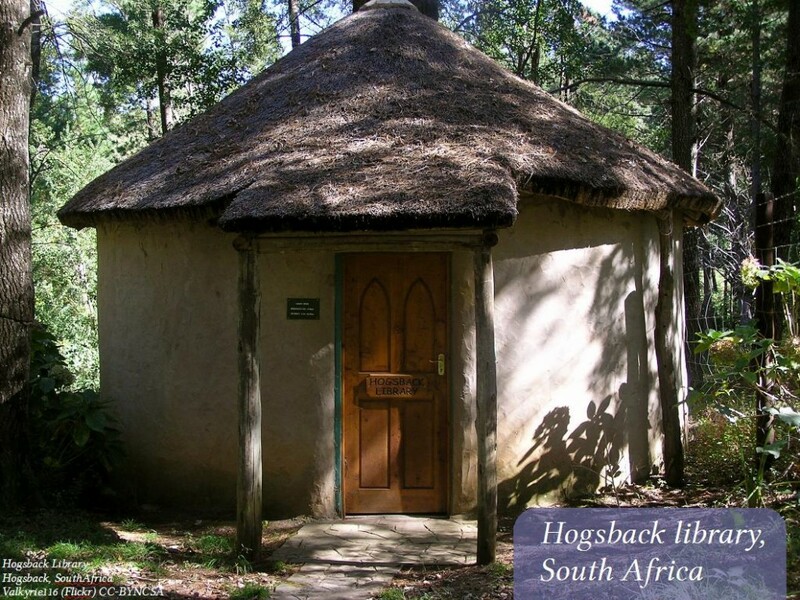 There are two things that get me really excited about the possibilities of digitisation, especially for Africa, and they’re not ebooks or ereaders: what I care about more are curation and licensing. Curation is a bit of a buzzword – it means finding good content and getting it to consumers, and it’s critical in a world of overabundant information. By licensing, I mean one big important thing: letting other people take your content to their markets, and pay you for it. And, obviously, curation and licensing are closely related. This is Allan. He lives in Malawi. And that’s his only t-shirt. And as you can see, its manufacturer is doing some curation for JK Rowling. When you give someone else a licence to take your content to a new market, they’re curating your work. So, you’ve got to make licensing easy for people, if you want your content to reach customers you can’t reach directly, and to make some money from that. So that’s what I’m going to talk about today. I’m going to talk about some technology you probably already know about, and then take the principles behind that technology further, and try to explain how anyone in publishing is going to sell meaningful amounts of book content into Africa. 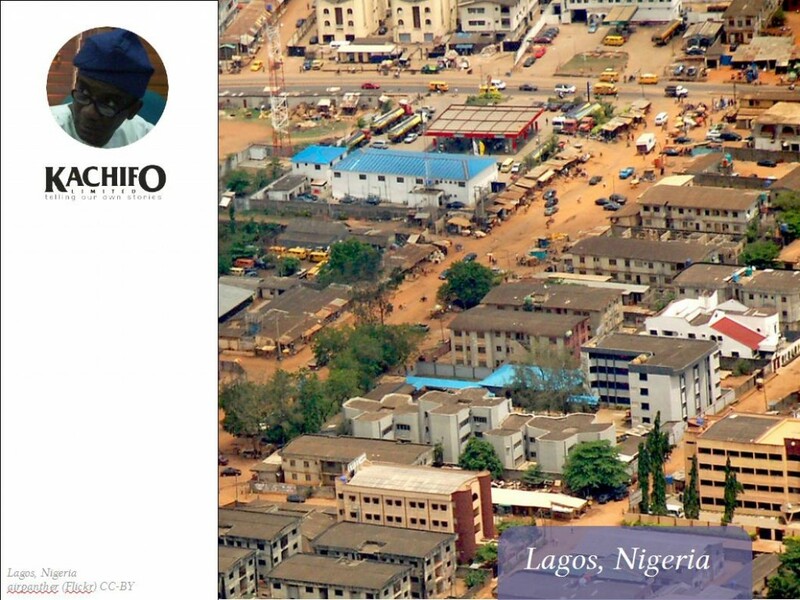 At the Frankfurt Book Fair last year, I met Muhtar Bakare, a banker turned publisher in Lagos, Nigeria. He owns Kachifo, the company that publishes Chimamanda Adichie, whose books are prescribed for hundreds of thousands of Nigerian schoolchildren. Bakare wants to put an Espresso Book Machine into his offices. For those of you who don’t know the EBM, it’s a machine designed by On Demand Books that lets you print and bind paperbacks one copy at a time, in about five minutes. You can print your own books or stream printing jobs from the On Demand Books catalogue. Anyway, Bakare wants to print the books he publishes on the EBM, one order at a time. His orders for Adichie’s books come in at a rate of about 200 books a day. The book distribution infrastructure in Nigeria, as it is in most African countries, just isn’t good enough to make it easy to print in bulk and warehouse these books. It’s going to be simpler and more efficient to use the EBM to print for those orders as they come in. But, of course, Kachifo won’t only sell their own books, because like every EBM owner they’ll have access to the wide range of books in the On Demand Books catalogue, which includes thousands from publishers around the world who use Lightning Source for print-on-demand distribution. As of last year, Lightning Source’s clients can let EBM owners print and sell their books. 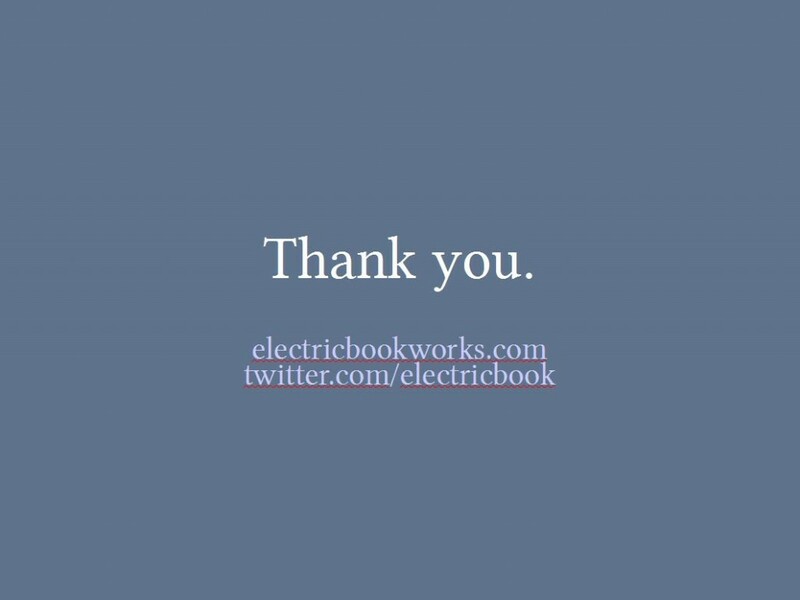 In effect, these publishers are licensing their books to be printed anywhere there’s an EBM, on whatever paper the EBM owner has, and to let that EBM owner sell those books to their own customers for any price, as long as the original publisher gets their wholesale price. This is one of those things that’s so obvious an idea that it’s easy to forget how significant it is. 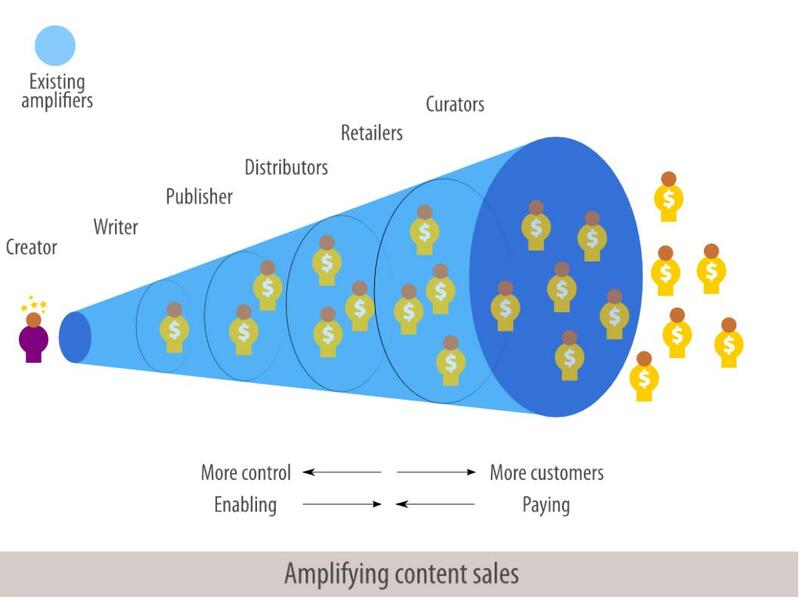 You see, publishers traditionally like to control exactly how and where their content is distributed. Here’s the traditional way publishers sell books. An author comes up with an idea. And from that point on, every stage in this megaphone adds value, taking that product to a bigger and bigger market, till hopefully it reaches thousands of consumers. And publishers know that when they add rights and licences to this megaphone, they get even more money from even bigger markets. Cool. This is of course the foundation of the London, Frankfurt and Bologna book fairs. 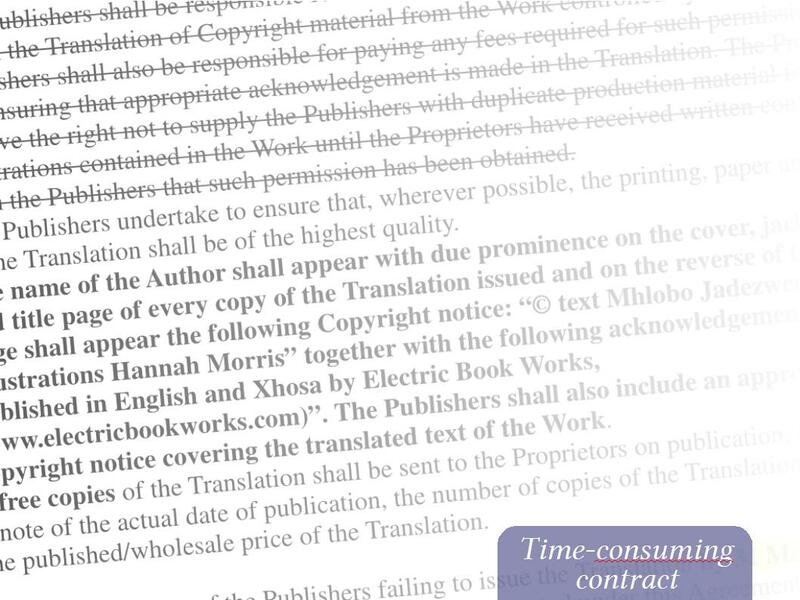 But in doing this, publishers like to negotiate complex contracts like this, specifying all kinds of conditions, even for small licensing deals. Here’s an example from my company. This one got us a $160 advance, which after splitting it with the authors didn’t come close to covering the time we’d spent in correspondence and negotiation with the Swedish licensee. We estimated that my colleague and I spent at least twenty hours working on this deal. If we’d been working at the rate we pay our student interns, Electric Book Works would have made $5 from that deal. I have not even been able to bring myself to calculate what we actually lost. And it’ll probably be a while before the licensee earns back their investment of time and their $160. We could have achieved the same thing if we’d let that Swedish publisher simply purchase a licence on our website, in much the same way they’d buy an ebook. 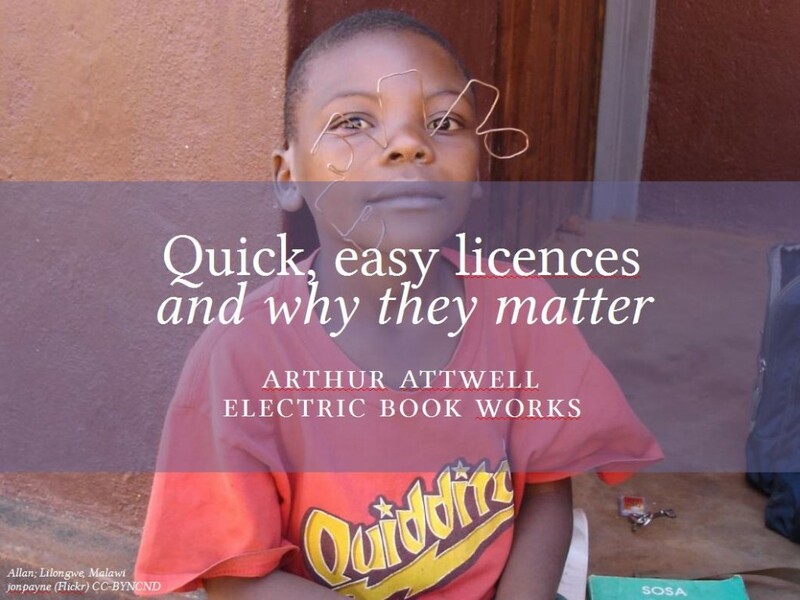 In order to maximise the number of licencees, you’ve got to make it really easy for people to buy licences. Ideally, a simple online purchase system will do. 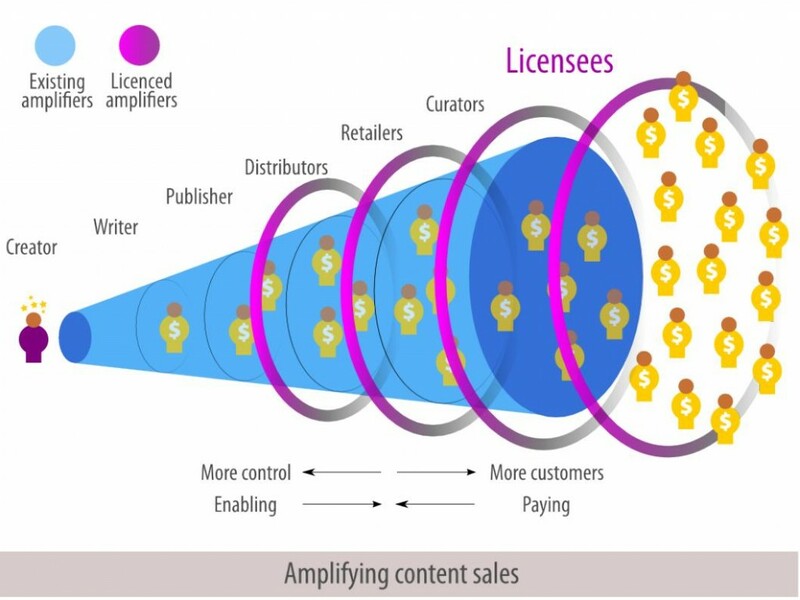 You don’t even have to provide the content; often the licensee already has the content. You just need to sell a licence, and all that requires, technically, is the metadata for the content you want to sell. Of course, this ability to sell licences instantly, online, already exists. 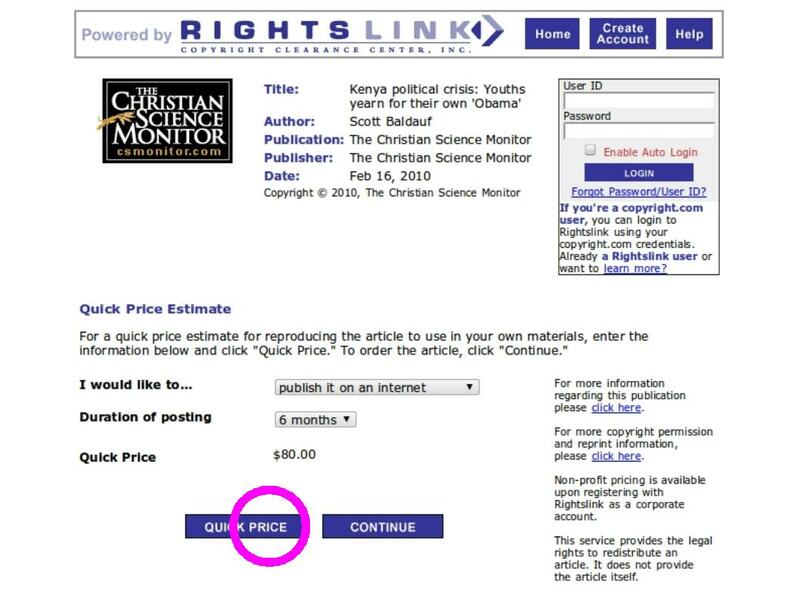 It’s been done best, I think, by the Copyright Clearance Center, whose Rightslink service lets publishers sell licences for basic reuses on the publisher’s website. There are almost fifty publishers using Rightslink, most of them pretty big. 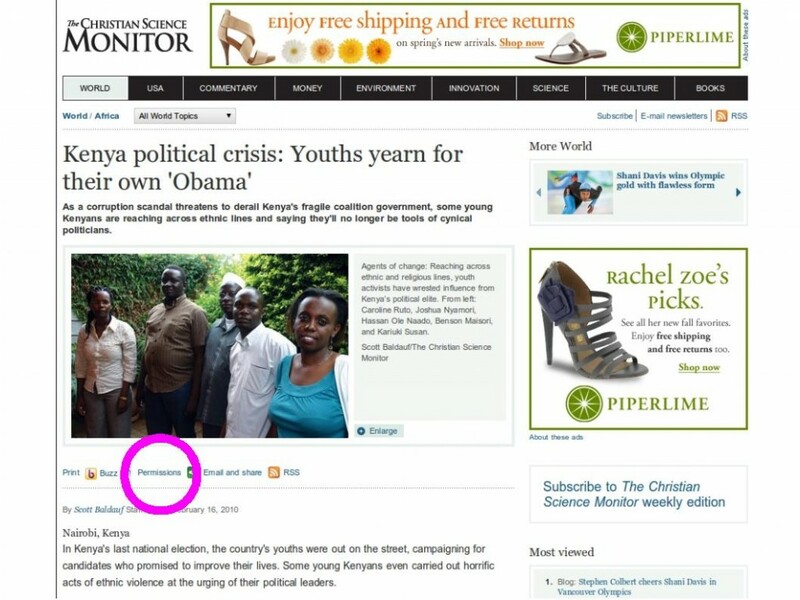 Here on the Christian Science Monitor’s website, I simply click ‘Permissions’ to launch a Rightslink window. This asks me for details of how I want to reuse this article, and will calculate a fee for me, which I can pay with a credit card. Man, that’s so easy, and what a pleasure. Rightslink is a very impressive service. But I want to take the concept a step further. Now I should say that the good folk at the Copyright Clearance Center are open to adding new and even unusual reuses to their service. But that’s not so much the issue. I’d like to see something even more flexible from publishers, where I as the licensee get to invent any reuse that suits me and my market, but I still get to enter into a non-exclusive licence agreement this easily. Find the article in a list. Pay a licence fee, or an advance against royalties, that the publisher determines in advance. Write a note for the publisher about what I plan to do. And I’m done. I can go ahead instantly. So, let me explain why that’s important to me. I’m from South Africa, and it’s quite clear in my part of the world that publishing has not and will not evolve in the same way there as it has here in the developed world. This is Ray. He’s from Nigeria originally, but now runs this little second-hand bookstore outside a supermarket near my office. Apart from small pockets of good book distribution systems in Africa, particularly in the wealthy suburbs of South Africa, this is how books are sold to most people on the continent, in small stores run by individuals. 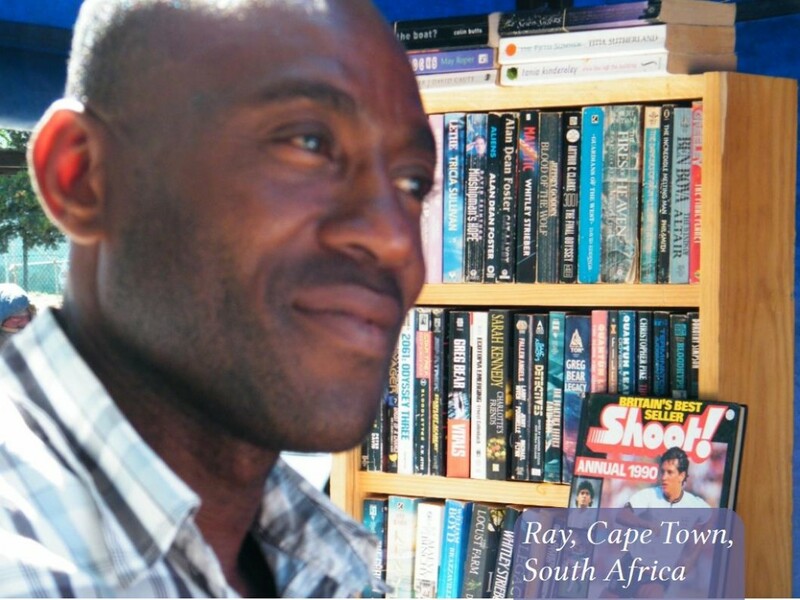 In fifteen years in the industry I’ve never heard any African publisher describe the book trade, averaged across any one country on the continent, as one with a vibrant, well-organised distribution system. That just doesn’t exist. As you can see, the people of Hogsback have to look sharp if they want to borrow books. Now I know you might think I’m using an extreme example to make a point. But it is actually not an extreme example. 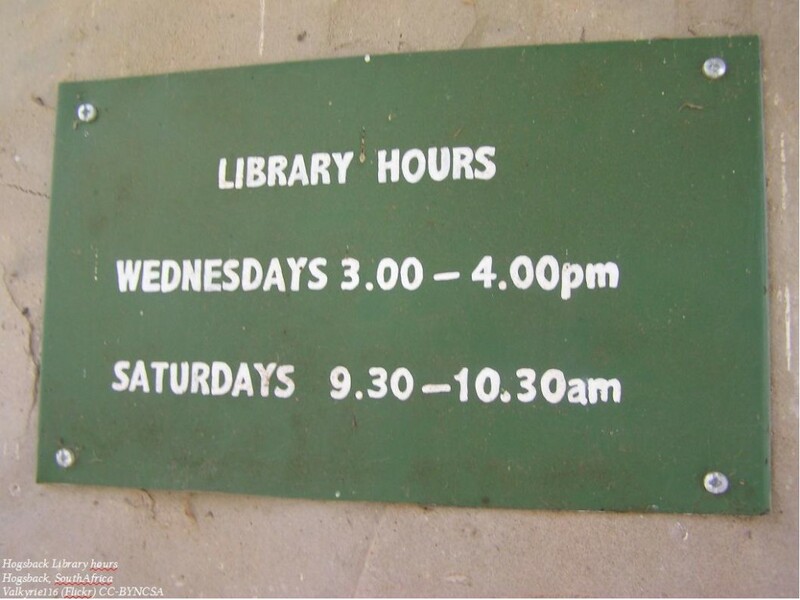 This is a better library than in most towns in South Africa. This is the reality of book distribution in Africa. The spaces in Africa are too vast, income is too variable, and book-publishing margins are too small, to make large-scale investment in print-distribution worthwhile, whether that’s for retail or for libraries. Right now ebooks are taking off here and in Europe as a natural evolution of a vibrant market for print books. In Africa, that doesn’t exist. Instead, localised, flexible, innovative uses of digital content will come from huge, leap-frogging steps we’re already making, jumping right past print-book distribution, and into an age of digital communication. It will eclipse any need for or prospect of a substantial print-based book trade. So, as far as I can tell, Africa is not a new market for printed books as we know them. It is a growing, thirsty market for content, but publishers are going to have to sell it to Africans to translate, and transform, and transfer (!) in a myriad small, customised ways. And we just can’t know what those ways will be. Could you have imagined this before you’d seen it? This is Alfred Sirleaf in Monrovia, Liberia. 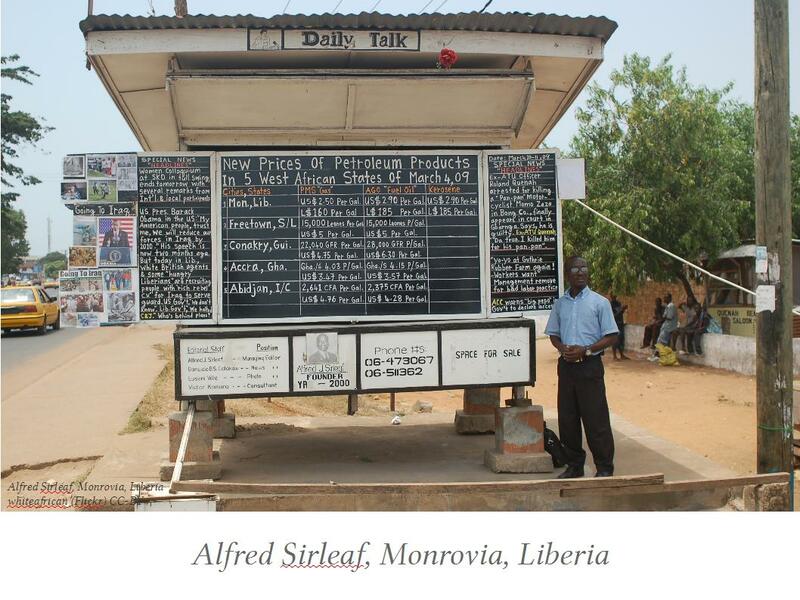 You may have heard of him as the “Blackboard blogger of Monrovia”. He writes up the news each day on this blackboard in the center of town, and makes some money selling advertising around the board. I know most of you think blogging on happens on a computer, but the reality is, this is blogging, and it’s effective, and this guy’s making his living off it! And Monrovia has a population of a million people. Let’s assume that only 1% of those people go to town every week, and 10% of those stop briefly to read Sirleaf’s boards. That’s 1000 reads a week! I wish I got that many readers on my blog! It’s the ultimate last-mile delivery platform. What if he wanted to serialise, say, Branson’s Screw it, Let’s do it on a board? I don’t think Virgin has ‘blackboard’ on their rights department’s list of possible reuses. And of course everyone’s talking about mobile in Africa. 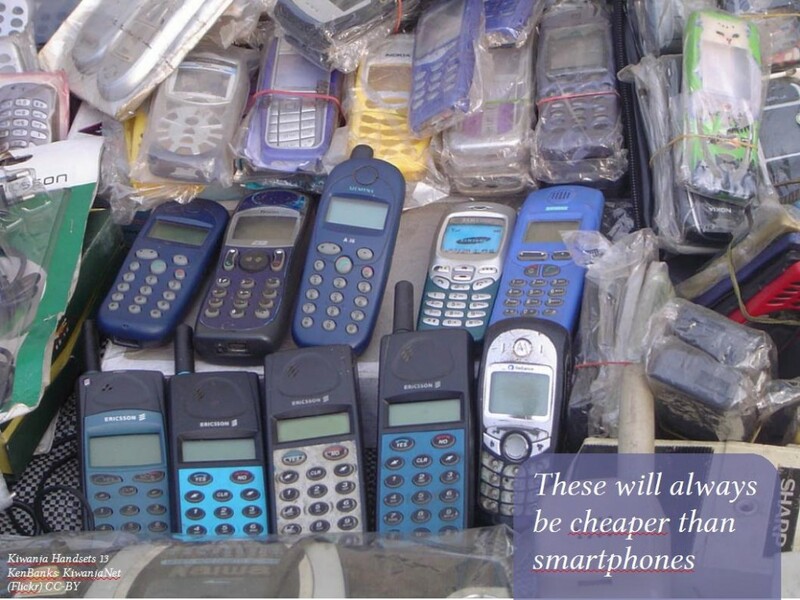 As you may know, there are already more mobile phones in the developing world than the developed. But do you really want to develop applications for all these phones? When you’ve got the iPhone, iPad and Android among your priorities, there is no way to justify the time and cost of developing for these phones. But in Africa, there are plenty people who will. Not only will they go to the effort of developing software for them but they will use them in novel ways. They’ll develop Java apps for basic phones, like Cellbook have in South Africa. There are SMS-based communication networks. In Kenya, nurses use SMS systems for tracking stocks of blood in blood banks. Mobile-phone-based payment systems like M-PESA make selling content on or in conjunction with mobile phones really easy. Anyone with a cellphone, even without a bank account, can make payments from their cellphone, and deposit and withdraw cash at airtime-reseller kiosks. In Afghanistan the same system is called M-Paisa, and will soon also include voice-menus for illiterate users in three different languages. It’s basically super-low-cost voice-banking. It blows my mind, really. 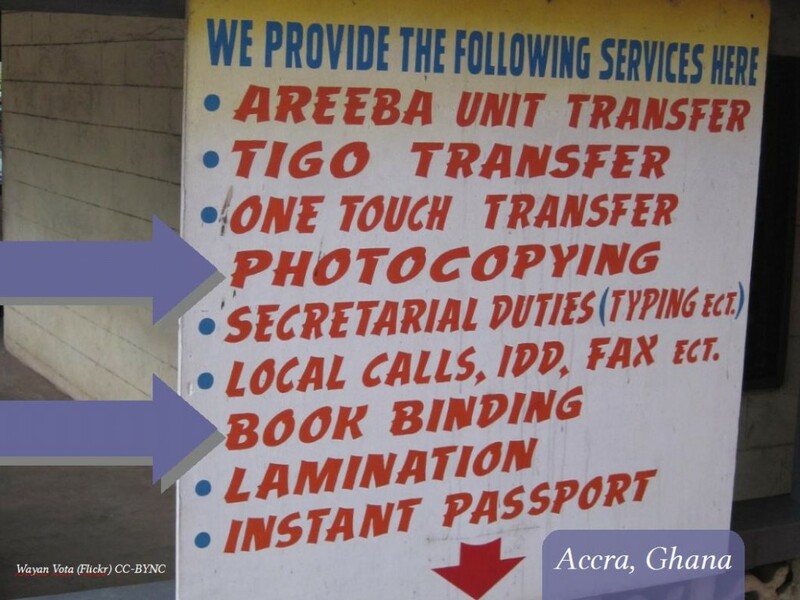 In India and in Uganda, Question Box offers call-based information services, where people make a call to a central info service from a free telephone in a box in a public space or form their mobile phones. Question Box operators manually help people find answers to questions about health, agriculture, business, education and entertainment. In a Ugandan pilot over about six months, they had 3000 calls, mostly with agricultural questions, like pest control on crops. Any one of these examples could make use of book content in one way or another. And soon there will be a hundred new uses for these old phones that you and I will never, ever be able to dream up in any number of meetings with our rights departments. And it’s not just about mobile phones, despite all the attention on them. Internet cafes are already everywhere. 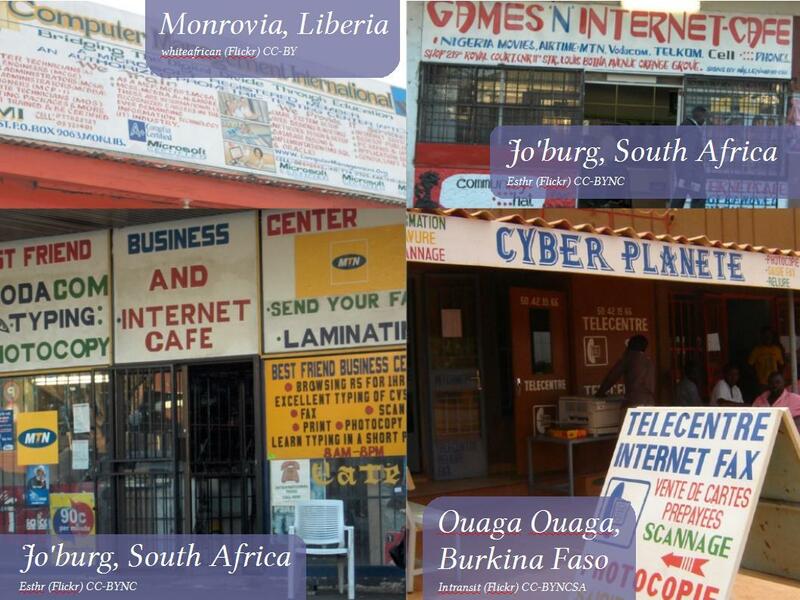 According to a recent ITU report, most Internet use in Benin, Burkina Faso, Cameroon, Côte d’Ivoire, Ethiopia, Ghana, Kenya, Nigeria, Rwanda, Senegal, Tanzania and Zambia takes place in internet cafes. Think of the dynamics of an Internet cafe: there is no time to read immersive text there, it’s too expensive and awkward, so consumers here will need book content repackaged for consumption in quick, well-curated chunks. For example, a startup in Cape Town I know have developed an application called Cognician that — with some manual human preparation — turns method-based books, like 7 Habits or The Tipping Point, into interactive mind-map-like applications, letting users explore and understand and apply the concepts in the books without spending hours actually reading them. Check out cognician.com. The same applies to students working in computer labs in colleges and schools. 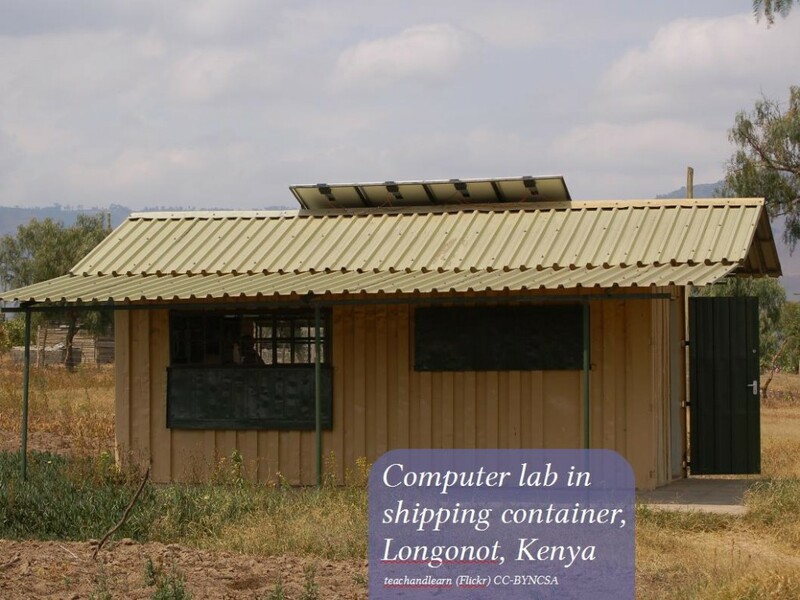 This is a school computer lab in a converted shipping container in Kenya. Converted shipping containers are often used for setting up computer labs quickly and cheaply. I’ve heard business plans from business people in South Africa who are looking to roll out turnkey Internet cafes in southern Africa on a large scale, and many of them may look like this. These students live in shacks in Khayelitsha, a poor area of Cape Town. They don’t have their own computers, but they make a plan, and they are very, very keen to be part of a digital marketplace. 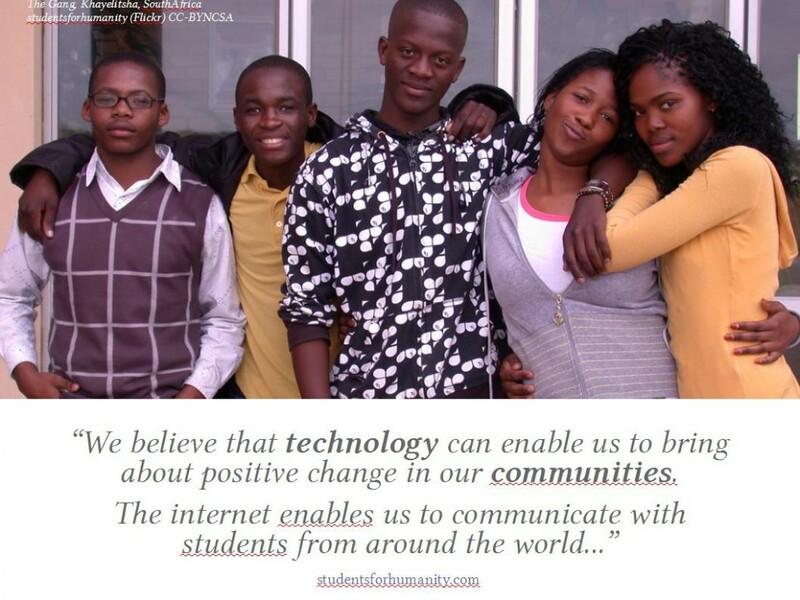 Again, to make this happen for them, you’re going to need local African businesses to translate content into their languages, design low-bandwidth web apps, repackage content for local use at lower prices, and set up local caches and download mirrors. Just to put the big picture in your minds: Africa is a continent of over a billion people, spread over fifty countries, speaking over a thousand languages. And most of them will never have enough money to buy a book a the retail prices you or I are used to. That is a big, complex place, and commercially it’s a good market only if you can find scale in that huge population without getting bogged down in the specifics of states and languages. So publishers inside and outside Africa are going to have to rely on local curators, entrepreneurs on the ground, to take their content over the last mile to consumers. While the big-print-run model may not ever take off in Africa (beyond schoolbooks), print on demand has a very bright future. Because the cheapest way to get a book right now is to copy it or print it out on double-sided loose paper. If really easy licensing were available, we could get print and copy shops — many of which are also internet cafes — printing book content for their customers. To help make this happen, Electric Book Works is building a system called Paperight that will let publishers let copy shop owners print book content for customers, for a licence fee. In our pilot project last year, we found that we could reduce the actual cost of printed books to customers by about 20%, and still get the publisher the same net receipts per book as if they’d sold a conventional copy. To make this happen, we have to automate reproduction-for-resale license deals for thousands of books in thousands of different locations, on the fly, often for single-copy print runs. We’re building it because we haven’t found as existing system that provides this particular kind of permission, and it’s absolutely crucial if content is going to reach more of Africa. 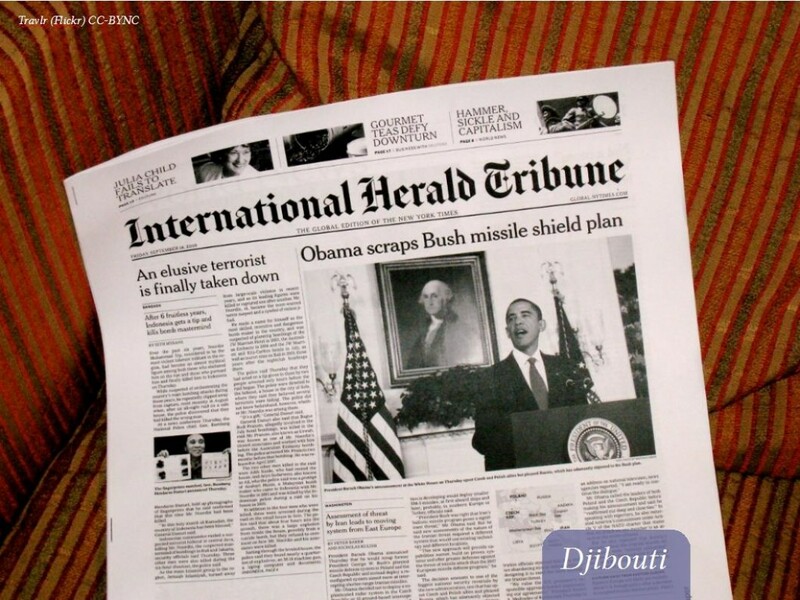 This is the New York Times, photocopied and distributed each day in Djibouti. I don’t know if it’s licensed, perhaps the printer uses Rightslink! But if not, could this copying be monetised by the publisher? Sure. Rightslink is one way, and there may be others. Of course, the question I always get when I raise this is: how do I monitor and enforce the licence agreement? What about piracy? My first, rather blunt answer is simply this: you’ve never had a technical, digital way to monitor and enforce license agreements before, why do you expect one now? But, let me give the question more credit, and explain this: making licensing scale is an anti-piracy strategy, not a piracy-enabling one. The prevalence of piracy in the developing world proves that customers there want content, and that someone local will meet that demand. But even if that someone wanted to do so legitimately, the cost of getting permission to reproduce and resell content is incredibly high. For rightsholders, on the other side of the coin, the cost of entering into traditional rights agreements is also high. Those costs are not only financial: there are all kinds of resource costs, including time, telecoms, language barriers, and unease and distrust caused by cultural difference. An automated permissions system lowers those costs on both sides. If the cost of getting permission were low, legitimate businesses could reproduce a publisher’s content, and act in their own self-interest as eyes and ears against piracy on the ground. If you’re a legit business, you can’t afford for another business down the road to be stealing the same content. Of course, licensees need to get some added value from going the legitimate route. This added value is easy to provide if you have direct contact with those who’ve used an online, automated permissions system: simply by email, perhaps in return for reports on sales and promotional activity, licensees could get access to up-to-date content, marketing materials, ideas from elsewhere in your licensee network, opportunities to sync promotional activity across the network, advance notice of upcoming content, and so on. Piracy-based businesses will always be at a disadvantage without access to this. The success of microfinancing programmes like the Grameen Bank, which rely on community peer-pressure, has shown clearly that people in developing countries highly value their relationships with creditors. And the same dynamic would apply to licensees who depend on publishers’ content for their own income. To wrap this up. Working as a consultant in digital publishing, I see publishers realise that their job is usually not primarily to make beautiful physical objects (though certainly there are publishers who excel at that). Their job is curating great content. 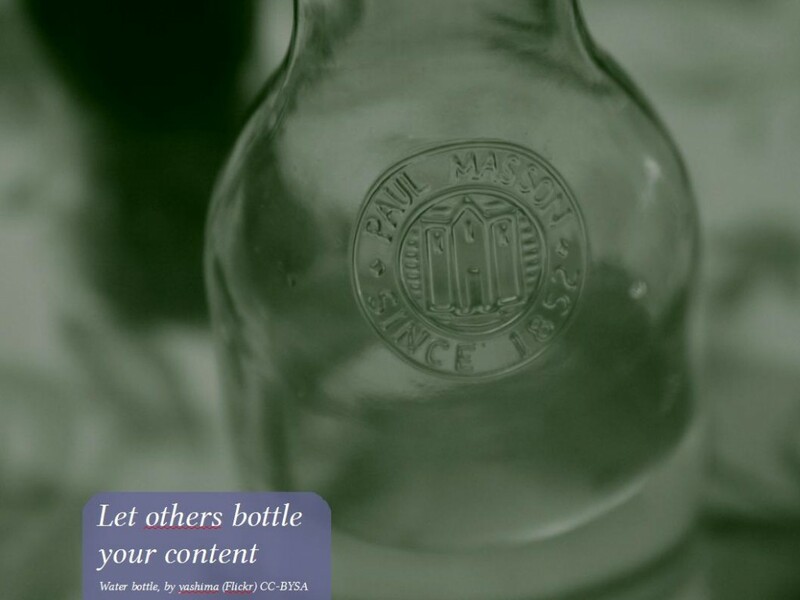 And once they start thinking of their content like water that others can bottle, rather than trying to bottle it all themselves, then flexible, fee-based licensing starts looking like an intruiging business model. Not all licensed reuses are going to make money. Of course not. You only need to win more than you lose. And right now, there’s nothing to lose anyway, certainly not in most of Africa. If you can make an easy, online system scale, by automating permission for any kind of reuse, real revenue could start showing up among the zeroes. Right now, while you’re building digital content repositories and metadata systems, don’t just think about selling ebooks. Think about selling quick, easy, online licences at the same time. This entry was posted in Business, Social issues and tagged conference, Paperight, presentation, TOC, Tools of Change by Arthur. Bookmark the permalink. Really interesting blog. Speaking of rights etc, I’ve posted a brief extract on my own blog with the relevant link backs etc – i hope you don’t mind. I think you’re very right in that licensing is one route Publishers should look at. Traditionally the industry is obsessed with form and context whereas the real value lies in the content. How you can get that content to as many people as possible in the ways they want it is crucial going forward. Hi Arthur. This is a great presentation. You’re absolutely right that there’s very little to lose in Africa for publishers to adopt a flexible and easy licencing strategy. Personally I’m also interested in looking at how to repackage content into different ways of ‘reading’ (a term whose definition is rapidly changing). Thanks for the link to Cognician. Awesowe post and wonderful pics! I’ve never seen Africa from this side! As a LIS student, this article has proven invaluable to my research on licences and has given me a better insight into the subject. Thanks Arthur! Randal, I’m really glad it was so useful. Thanks for letting me know.